Spain and Czech Republic are tied after the first day of the Davis Cup final as David Ferrer and Tomas Berdych both won their respective matches in Prague. Spain’s Ferrer beat Radek Stepanek 6-3 6-4 6-4 in a hard-fought opening match. Berdych had a dramatic encounter with Nicolas Almagro, but clinched a 6-3 3-6 6-3 6-7 (5-7) 6-3 win for the hosts. Ferrer and Berdych face each other on Sunday after the doubles rubber between Ivo Minar and Lukas Rosol and Marcel Granollers and Marc Lopez. Ferrer got the reigning champions off to a good start against Stepanek, breaking the Czech in the eighth game before holding serve in the next with a remarkable return from Stepanek’s volley to take the first set 6-3. The Spaniard won the first two games of the second before Stepanek regained his composure. The Czech broke back in the sixth game, but again Ferrer responded and saw out the set 6-4 – his fizzing forehand in the ninth game, a highlight. Just as he did at the start of the second, Ferrer broke Stepanek again at the beginning of the third before going on to seal the victory. “My next match against Berdych is going to be difficult. 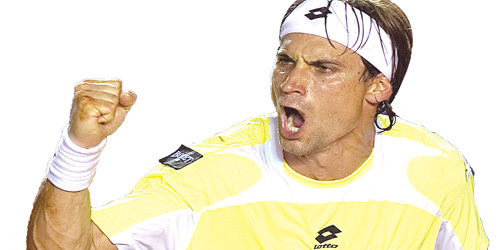 The surface suits his game better – I will have to be very focused,” Ferrer said. In the second singles rubber, Berdych faced world number 11 Almagro in what was an exhilarating affair. One of the standout moments of the first set occured when the Czech produced a winning dipping cross-court forehand in the eighth game – breaking the Spaniard to take a 1-0 lead. Almagro bounced back in the second set, but the home support in the O2 Arena raised the temperature at the start of the third after a controversial point. Berdych thought he had won a game-winning point with a pick up at the net, but it was called out by the umpire. The Czech challenged and the ball was called in, but they had to replay it much to the annoyance of the home crowd. The world number six then blasted his serve past Almagro in the replayed point, smirking as he walked off court for the break before taking the set 6-3. However, Almagro took the match to five sets after taking the fourth on a tie-break. Berdych broke to lead 4-2 in the decider, and although Almagro responded in the next, the Czech player managed two more breaks to win the match in three hours and 58 minutes.